Keeping senior citizens safe from harm is everyone’s responsibility, especially the professionals who work with them on a daily basis. Elder abuse is a horrible crime and it happens way more than people realize. Not only should anyone who works with the elderly who suspects or witnesses elder abuse, report it, in Illinois it is actually a law. Elder abuse is thought to happen to about 76,000 elderly people every year, however, only about 10,000 reports are made each year. Much of this abuse may happen the home or even in nursing homes but victims are too scared or ashamed to report the abuse. That is why it is so important that anyone who works with the elderly and suspects there may be abuse, reports it to authorities. ..causing any physical, mental or sexual injury to an eligible adult, including exploitation of such adult’s financial resources. Abuse can include physical signs such as bruises, decubitus ulcers and other obvious injuries that seem suspicious. It also may be less noticeable, but apparent to care givers such as weight loss, change in appetite, emotionally withdrawn or personality changes. Financial exploitation may be happening when there is no explanation for repeated withdrawals from bank accounts and bills are not being paid. For anyone who in good faith reports elder abuse, the Elder Abuse Act protects him or her from criminal or civil liability, and also from professional disciplinary action. The Act also protects the identity of the reporter unless they give written permission to release their name or it is court ordered. Anyone can also report elder abuse anonymously, if they choose. Reporting Abuse: Where to do so? 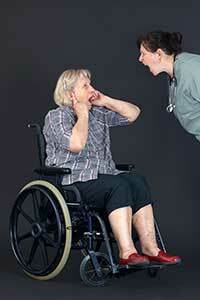 There are local agencies in almost all localities in Illinois where you can report elder abuse. You can also call the state hotline for the Illinois Department of Aging that is available 24-hours a day at 1-866-800-1409. They will want to know the name, age, address, phone number and gender of the victim and will ask you for details regarding the suspected abuse.